This KIT contains almost everything you need to enter to world of multi rotor UAV flying. You only need to add your own Radio, Rx/Tx modules and Battery + Connector, every thing else is provided in this kit. Please note: These are built to order and will always show as Pre Order, please allow 15 working days from time of order for delivery. What is an ArduCopter multirotor HexaCopter? 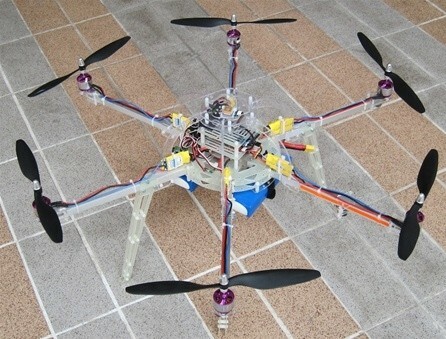 The ArduCopter is a multi rotor amateur UAV development platform and is for DIY people. Even if you are not a software developer or "hacker" who would like to tune everything, you can still enjoy this community product. It also allows people to built their own custom mini UAV or just an ordinary Radio Controlled toy, it all depends on it's owners needs. You can also program everything by yourself or use the free software that is developed by DIY Drones community, the software is updated almost daily and can be downloaded from the free download and use mission planner. jDrones are part of software development group at DIY Drones, software support for it is provided on their website on ArduCopter forums areas. To be part of the exciting new world of open source Ardupilot Multirotor UAVs, which is supported by DIY drones community. This jDrones HexaCopter offers a solution for anyone who wants a ready to fly ArduCopter Hexacopter. There is no need to solder or programming for the first time, the kit comes with the well known Ardupilot Mega 1.4 version, with IMU/Oilpan Board, GPS Mediatek with basic adapter and Magnetometer. Also as optional you could add telemetry electronics and optional Xbees modules. The hexacopter multi rotor UAV is individually tested before it ships, more information about ArduCopter Hexa can be found here. You will need to add your own Radio, Receiver and battery to make it fly. After the receiver is installed, you need to make quick radio and level calibration from simple mission planner set up page. The center area can be used to mount a camera mounts and other devices, camera mounts can be found here. Everything else not listed here are optional and ArduCopter can be expanded with them, users can build their own expansions. Eg. This kit does not contain: Camera, Video systems, Batteries, Radio or other devices. Contents: Fully assembled ArduCopter Hexa v1.0, is shipped in folded form, some basic construction is needed. Please note you will still need to add a Radio, Receiver and Battery to make this kit fly.